Home » Education » Is It A Fiddle Or A Violin? 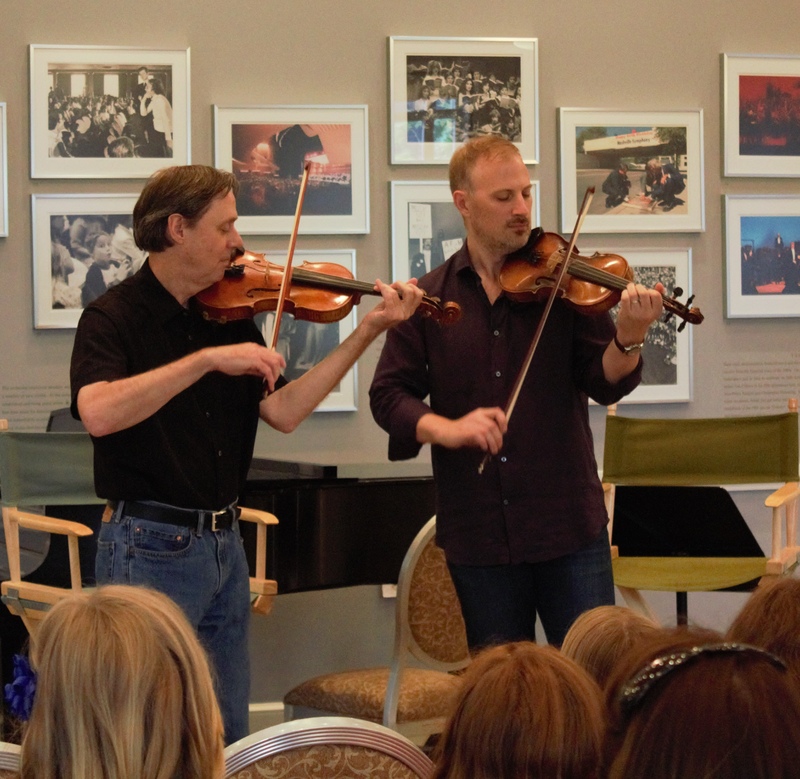 David Coe and Matt Combs – two local musicians who have been with the program since the beginning – largely co-wrote the featured presentation which gives the program its title. I sat down with David and Matt earlier this year to talk about Is It A Fiddle Or A Violin? WB: So you’ve both been doing this together all this time? David Coe: Yes, since the very beginning. We were just talking about it – its been eight years. Matt Combs: Yes, it was 2006 when we started. WB: So you’ve been doing this about eight years, and you do about a dozen shows a year. Has the format changed over the years? Or has it been pretty much the same for eight years? MC: I’d say it pretty much follows the same path. DC: We changed it up at the beginning, when we were trying to find what form we wanted it to take… a lot of the work was editing it down, because with a short program it goes by fast, so we had to make sure we got our points across quickly and played the music we wanted to play. But now we’re pretty set. WB: Did you two write this show together? DC: Yes, we did. We had some help from people here, from the (Country Music) Hall of Fame and from the Symphony. MC: Mitchell Korn was here previously (at the Nashville Symphony), and he helped us tighten up the show a little bit. DC: …but we definitely brought in the music, and some ideas. WB: You’ve been doing this show about a dozen times a year for eight years – you’ve done this show close to a hundred times by now. Has anything unusual ever happened during one of your shows? MC: My hope is that, of these thousands of kids that we’ve played for over the years, some of them have – because of this – said “hey, I want to do that”, and I don’t know, maybe they have? There’s bound to be a few that have done it, that would be the hope. DC: That’s kind of how it works. You play, you put it out there, and it connects with somebody…a lot of times you can kind of see it, you’ll see some kid out there that you can tell, is into it, got it, that’s fantastic! WB: Since you’re sharing both traditional fiddling music and classical music in the same program, do you feel like they respond more to one or the other, or do you think it’s a mix? MC: It seems like they enjoy all of it. DC: It does to me too. My natural inclination is to think that they will like the fiddle better, just because it’s lively, but that hasn’t really been the case. They respond to it all. I think that for kids or adults, the power of live music, of sitting and having musicians right in front of you playing, in any form, is pretty powerful. I think people respond to that. MC: And the age group that we get, they are still really open…they haven’t decided what’s cool and what’s not cool yet. DC: If they like it, it’s good! MC: I think the program is great, especially for this city, and the partnership between the (Country Music) Hall of Fame and the Symphony – it shows that the world of music is not separated: it’s together. DC: Hopefully it will get some kids playing music! MC: Yes, something the world needs badly. DC: We hope that they’ll pick up a fiddle or a violin, but the truth is we don’t care what they play! David and Matt will present the first Is It A Fiddle Or A Violin? of the season this morning for a group of homeschool students. Find the scheduled dates this program will be presented on the Nashville Symphony website, and click here to download the complete and thorough Is It A Fiddle Or A Violin? Teacher’s Guide with pre-visit and post-visit classroom lessons aligned with state standards. For reservations, please contact the Country Music Hall of Fame® and Museum at 615.416.2088. 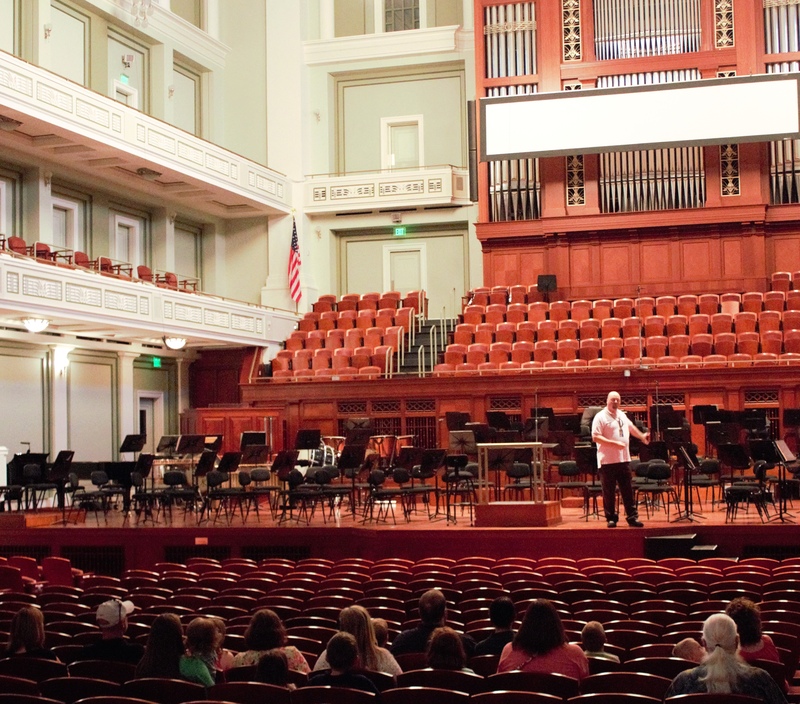 By walterbitner in Education, Music Education, Nashville Symphony, Nashville Symphony Programs on August 26, 2015 . Nice article. My opinion on the eternal question? It’s a fiddle.